If you’re currently suffering from postpartum hair loss, you’re not alone. It’s a fairly common right-of-passage for mothers the world over. Along with this, you may also experience sensitive teeth, itchy armpits, mastitis, backache – the postpartum list of ailments goes on. But this is all part of motherhood. And while you’re cradling your little love in your arms, you really should be counting your blessings rather than your aches and pains. Yes, postpartum hair loss is completely normal- here’s everything you need to know about this early foray into motherhood. I’ve just had a baby, why is my hair falling out? Of all thing to be concerned about, now it’s your hair. How does one possibly relate to the other? 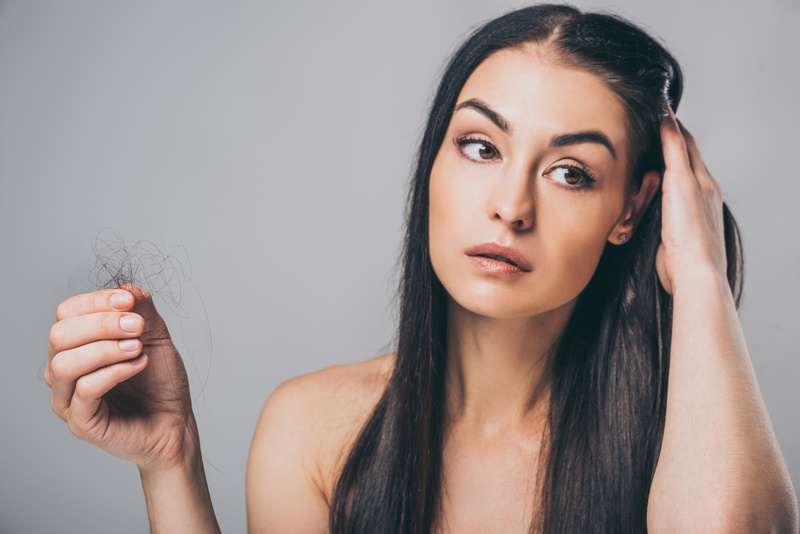 Postpartum hair loss is a reality for many women and is characterized by a sudden shedding of hair, typically in clumps. This usually lasts anywhere from 6-12 months post birth. So, what is the cause behind this baffling postpartum symptom? The science behind postpartum hair loss is quite simple. On average, a person loses up to 100 individual strands of hair a day. When you’re pregnant, elevated hormone levels prevent this from happening. Naturally, your hair may appear beautifully thick and lush because of the additional hair on your head while pregnant. But, as soon you give birth and your hormone levels drop back down to their “normal” level, those extra hairs drop, too. So, in essence, you aren’t actually losing much of the original thickness of your pre-pregnancy head of hair. But bear in mind that if you’re breastfeeding, some this additional hair may hang onto your scalp until you begin to wean or supplement with formula. Breastfeeding can contribute to elevated levels of hormones, hence the reason why your body hangs onto the additional hair for longer. How Much Hair Should You Be Shedding? If the average person loses around 100 strands of hair a day, postpartum mothers lose approximately quadruple this amount. On average, you should lose about 400 strands of hair a day- but you don’t need to go counting them to be sure! Just keep in mind that clogged shower drains and hair-matted pillowcases are normal. By 6-months postpartum, your hair shedding should slow down and resemble your pre-pregnancy hair loss rate. However, if your hair loss has not slowed down by this time, it’s a good idea to consult with your doctor. You could be suffering from low levels of ferritin (a blood protein) or iron because of pregnancy. Your thyroid could also be playing up, which contributes to hair loss too. Your doctor will perform blood tests to check for all of the above. Can Postpartum Hair Loss Be Treated? There is no miracle cure for postpartum hair loss. The only way to overcome this postpartum symptom is to look after your body. Ultimately, the hair that is ready to drop from your head will drop, no matter how much or how little you wash your hair. So wash it as often as you normally would. During this 6-month period of hair loss, make sure your blood sugar, iron, ferritin, zinc, and vitamin-D levels are normal. This is achieved by continuing your prenatal vitamins and eating a healthy diet. Yes, it’s easier said than done, especially with a newborn, but try and minimize your daily stress. Eat a diet that’s rich in protein to aid in the new hair growth process. If your blood work is completely normal but your hair loss has not slowed after the 6-month mark, see a dermatologist for advice. They can prescribe medication to reduce inflammation of your hair follicles and try laser therapy to stimulate new hair growth. Use soft, material scrunchies or barrettes to tie your hair up- avoid rubber bands and tight ponytails! The health of your newborn is important but so is yours in order to nourish and care for them to the best of your ability. By nourishing your body from the inside, out, you should be able to minimize your postpartum hair loss to an average 6-month period. If you are losing clumps of hair around your hairline or temples, the best way to disguise this is by changing your hair part. Go for a side parting if you normally part it in the middle. Alternatively, consult with a hair stylist on the best hair cut for postpartum hair loss and how to make thinning hair look thicker. If you previously had long hair, a shorter cut with long bangs around the face can help to revive your hair and make it look luscious once again. Adding texture is another great way to create the illusion of volume. If you usually straighten your hair, now is the time to embrace your natural curl or wave! If your hair is naturally straight, you don’t have to heat style it to achieve a textured look. Add foam rollers to your hair while it’s still damp, sleep in them and unravel to wavy tresses in the morning. If postpartum hair loss is a daily reality for you, Tricovel’s revolutionary products help to keep your hair healthy from root to tip. See and feel a physical difference in your hair with thanks to Tricovel’s patented compound, Biogenina. Learn more about our fortifying shampoo here for strong, healthy postpartum hair!